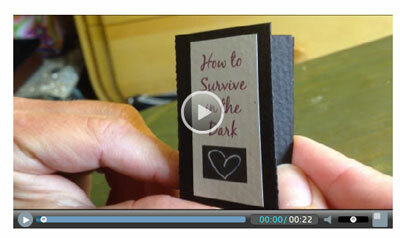 Yesterday a post went out with a link to my Tiny Book, “How to Survive in the Dark.” I’d pre-scheduled that post a while back because I knew I’d be visiting family and not online much at all while we were together. The Tiny Book was created for Maya Stein and Amy Tingle’s Type Rider 2 and having just cheered them on at the finish line in Beloit, I knew I’d want to celebrate their journey as well as share my Tiny Book. I was rushing around when I scheduled the post. I wanted to share my book, but didn’t have a lot of time to think about what was behind my creating that particular book. But of course, little did I know that the week I’d scheduled this post, there would be the tragic suicide of Robin Williams. I didn’t remember my scheduled blog post until today, when I returned to the office. I realized that if I had written that post this week, it would be a very different post. So this is my re-do. Throughout my life, I’ve often felt ashamed of that thin wall between my joy and depression. I’ve also been terrorized by it. But I’ve been fortunate in that I crossed paths with so many kind and loving teachers, each of whom gave me tools and practices to help me move away from the darkness and inner judgment — and toward pinpricks of light. There have been so many discussions these past few days about depression and suicide. Robin’s death tapped into a well of grief and fear. Many of us feel the loss of this beloved actor who brought us so much laughter, thoughtfulness, and joy. But I think we’re also feeling a shared fear of the depth of despair. If we don’t know that place ourselves, it is likely that we know and love someone who does. We’re all wired differently, though. We feel the highs and lows differently. And we can never really know what it is like inside anyone else’s skin. To live within someone else’s inner landscape. To live within anyone else’s uncertainty or despair. I just feel such a rush of compassion for Robin Williams, his family//friends … and all of us. We can’t hold Robin William’s hand or talk to him in the dark hours of the night. We can’t sit with him silently, while he weeps. We can’t read him poetry or take him to our favorite dahlia garden. But we all have people in our lives whom we love. And we can offer these things to them. We can see them as they are. And love them as they are. As a tribute to Robin Williams, perhaps we can all take the time to reach out to one or two people in our own lives whom we know may be suffering in some way? And if you know someone who is especially in the dark right now and you want them to receive some extra love, let me know. I’d be happy to send a handwritten note to loved ones of the first ten folks who email me. P.S. If you didn’t read my Tiny Book, you can do so here. It will take you just 22 seconds.